Rising from previously empty industrial lots in Northeast DC, NoMa, a fun moniker for “North of Massachusetts Avenue,” has quietly become one of the hippest neighborhoods in the city. Being a relatively new section of DC, many might not know what NoMa is all about, or if it has an identity at all. But NoMa has taken its blank slate reputation and made itself a community full of art, smarts, cuisine, and outdoor activity. If you don’t believe us, we’ve made this handy neighborhood guide that highlights all that this delightful growing neighborhood has to offer. NoMa sits -ahem- north of Massachusetts Avenue, starting with historic Union Station at the southern point and ending with delicious Union Market to the north. Its roughly contained by New Jersey and New York Avenues Northwest and 3rd Street Northeast. Laced throughout these roughly 30 blocks is free public wifi, making NoMa the first DC neighborhood to offer such an amenity. The railroad tracks bursting from Union Station act as a spine of the area, and development has spilled out steadily from both sides of it. Given its location along these tracks, NoMa is also one of the most connected neighborhoods in the city. Union Station is the jumping off point to get from DC to literally any city along the East Coast and beyond. It’s also the starting (or ending) point of the 8-mile Metropolitan Branch Trail, making NoMa an incredibly safe and enjoyable walk or bike ride. If you’re looking to go a bit faster, you may be in luck; permits are in place in NoMa for construction of Elon Musk’s Boring Company hyperloop, which would potentially shoot riders from D.C to Baltimore in 15 minutes. In the early 1850’s, mostly working-class Irish immigrants populated this area. Back then, they called it “Swampoodle” because of the overflowing banks of the Tiber creek. In 1864, President Lincoln signed the charter of nearby Gallaudet University, the world’s first (and still the nation’s only) university with programs designed specifically for the deaf and hard of hearing. In 1998 D.C. officially designated the area “NoMa,” but it wasn’t until the 2004 opening of the NoMa-Gallaudet University Metro stop that a new vision and life was breathed into the area. And development hasn’t stopped since. NoMa boasts a few historic gems that have since been restored to new glory, including Union Station. But perhaps less well-known is the the large, barrel-vaulted Uline Arena. Uline Arena was built in 1941 as the “Washington Coliseum” to host an amateur ice hockey league. It was the venue for the Beatles’ first-ever concert in the U.S. in 1964. It fell into obscurity in the 70’s and was almost demolished before being recently restored. It’s now home to tenants including the largest REI store on the East Coast, and a gorgeous SPACES coworking facility (try to get an invite to one of SPACES many events and check out their private patio). Take in the sprawling architecture of Union Station, which, besides being a transit hub, has become a mecca for popular dining and shopping, including trendy spots like Warby Parker, Uniqlo, Blue Bottle Coffee, and more. Have an afternoon beer at Wunder Garden, a huge outdoor beer garden with amazing vibes and cute dogs. Check out their many free themed events. Finish off your day at Union Market, DC’s go-to food hall. Part food hall, part food incubator, Union Market is where you’ll find all the newest food and drink in the area (plus outdoor movies!). #FrayLife Tip: Union Market is also the host of the annual All Things Go Fall Classic music festival. Check out this year’s October lineup and snag your tickets. Indigo: A cozy neighborhood joint serving bold flavors and popular Indian dishes. Enjoy outdoor dining on their newly expanded patio. NoMa Farmers Market: In partnership with FRESHFARM, NoMa now has a brand new Sunday farmers market where you can snag fresh food from regional vendors. Gorsha: Grab some creative and contemporary Ethiopian at this spot inside Union Market. And finish it off with another Union Market favorite, Toli Moli, a fantastic Burmese bodega. Masseria: Get your fine dining on at this Michelin star restaurant, where chef Nicholas Stefanelli is creating beautifully simple Italian dishes. Pluma by Bluebird Bakery: This bright cafe near Union Market offers quality coffee served with hand made pastries. Quaila Coffee: Enjoy fresh, house-roasted brews and scrumptious baked goods at this cozy hangout. Lily and the Cactus: This modern Southwest American-flavored lounge is great for food, but the drinks are what you’ll want to enjoy on its spacious outdoor patio tucked away inside the Hilton Garden Inn. #FrayLife Tip: Be on the lookout! A brand new brewery is coming soon to NoMa. Red Bear Brewing will be bringing a taste of the Pacific Northwest to their new brewery inside the Uline Arena. It will also be the first 100% gay-owned brewery in D.C.
Angelika Pop Up Theatre: Catch the latest film or an underground indie film at this laid-back cinema. Underpass Art Parks: Experience the new interactive art installations inside of the underpasses of the Amtrack. “Lightweave” and “Rain” will be complete soon on M and L streets, with two more to come on K street and Florida Avenue. Smithsonian National Postal Museum: Yes, this is a Smithsonian museum, and we bet you you’ve never actually been. Now’s the time to cross it off your list. Learn surprisingly interesting facts about the postal industry, and even create your own postcard for you or someone else as a super unique gift. Pow! Wow! Washington, DC: For ten days each year, a curated group of international artists descend upon DC to create larger-than-life murals, and NoMa has hosted for the past three years. Pow! Wow! 2018 ended in May, so now is a perfect time to be the first to get that Insta pic in front of the many fresh and righteous murals. This new neighborhood in town has carved out quite the reputation for itself in just a few years. And if the cranes dotting the NoMa skyline haven’t told you already, there’s so much more to come. Did your favorite spot make the list? What are you most looking forward to in NoMa? Let us know in the comments. Need another awesome DC neighborhood to explore? 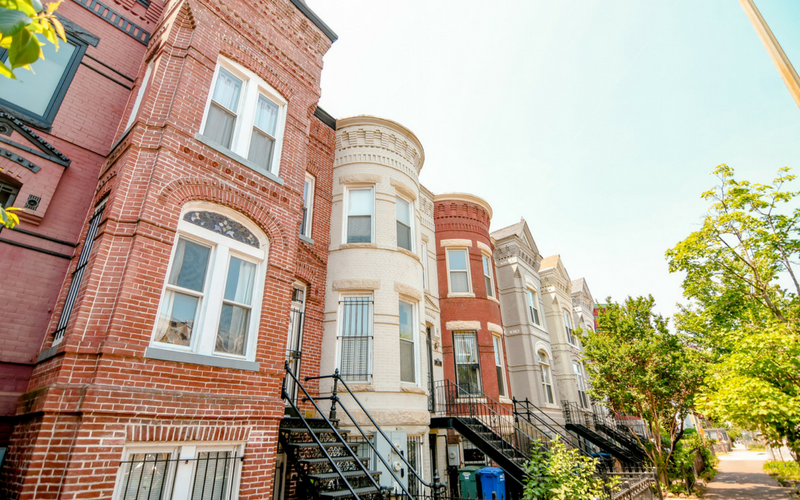 Check out the #FrayLife Guide to Adams Morgan.